Spring’s finally here. Trees have started to bud, hibernating animals are awakening, and wildflowers have started to peak from the soil. To make sure you get the most out of the outdoors, have a custom deck built this spring. A custom deck fits your needs because you design it, choose the materials you want, and then have it professionally built by Freedom Fence and Home. The first and primary reason to have a custom deck built this spring is that with a custom deck you use your design and get exactly what you want. You don’t need a degree in architecture or engineering either, as our designers will meet with you to talk over what you want and draw up a deck that meets your specifications. With a custom deck you can emphasize what’s important to you and your family. You can make your deck a temple to the art of grilling with a raised platform with fitted areas for your grill and smoker. You can make your deck a place of private retreat with a screened in gazebo off of one corner, the perfect setting to sit down and read on lazy summer afternoon. Or you could make your deck a giant play set for your kids with slides, swings, and special climbing walls. The best reason to have a custom deck built is that you can have what you want in a deck and make it truly yours. The second reason to have a custom deck built this spring is that with a custom deck you get to you your choice of materials. You can choose whether you want wood, composite, or PVC. If you like rustic and natural then wood is the material for you. Wood requires the most work, but properly maintained, will last a long time. Regular sealing is necessary if you want to keep your wood looking new for a long time. If your want your wood to continue to look fresh and it has started to fade it can be sanded, stained and sealed, that can’t be done with every decking product. And if you like rustic, there’s nothing quite liked weather aged wood. Wood is also generally the least expensive decking material, granted the use of some rare woods can make it more expensive. Composite decking is manufactured from wood fiber, plastic, and a strong adhesive. Composite decking is a relatively recent development in the decking industry, its use having started in the nineties. It’s more expensive then wood, but requires far less maintenance. Composite comes finished and doesn’t need to be sanded, stained, or painted. It also does not need to be sealed as frequently as wood. Composite is also more resistant to fading, scratches, and stains, however it can still happen, and unlike wood, a composite deck cannot be sanded and stained in that instance. Composite can be made to imitate wood, but doesn’t do so perfectly, so if you want the look of real wood, you should go with real wood. PVC decking is manufactured from polyvinyl chloride, a common plastic, extruded into boards. The boards may be manufactured to include the appearance of real wood grain or brushstrokes. It’s one of the most expensive materials used in decking because the manufacturing process for the boards hasn’t been perfected yet and one in eight has to be discarded and recycled due to its unsuitability to be used as construction material. However, PVC makes up for its cost by requiring the least maintenance of any type of decking. It has strong fade, stain, and mold resistance and is easy to clean. It never needs to be stained, sanded, or painted. Though it can be manufactured to look like real wood, it still has a bit of an artificial appearance, and feels markedly different from real wood. Whether you choose wood, composite, or PVC decking is up to you with a custom deck. You may think an increased upfront price is a worthy investment if you don’t want to deal with maintaining the deck farther down the road. On the other hand, you might prefer the natural appearance of real wood, and may not mind the extra work that comes with it. The point is, with your custom deck, you can make it the way you want, with the material you want. Our third reason to have a custom deck built this spring is having your custom deck professionally built. A professionally built custom deck from Freedom Fence and Home is guaranteed to be safe, durable, and long lasting. Ensuring that the deck we build is safe is first and foremost in the minds of our designers and deck builders while they’re working. They will make sure the design is stable, the deck foundation and footing is secure, and that the rails and stairs are properly constructed. And to make sure it’s long lasting and durable our builders only use the best quality materials and tools for building your deck. Having a custom deck built by Freedom Fence and Home means having your deck built by a business with an “A+” rating from the Better Business Bureau, winner of the 2013 Talk of the Town Customer Satisfaction award, and five year winner of Super Service Award from Angie’s list. Freedom Fence and Home has been installing wood, composite, and PVC custom decks for years. 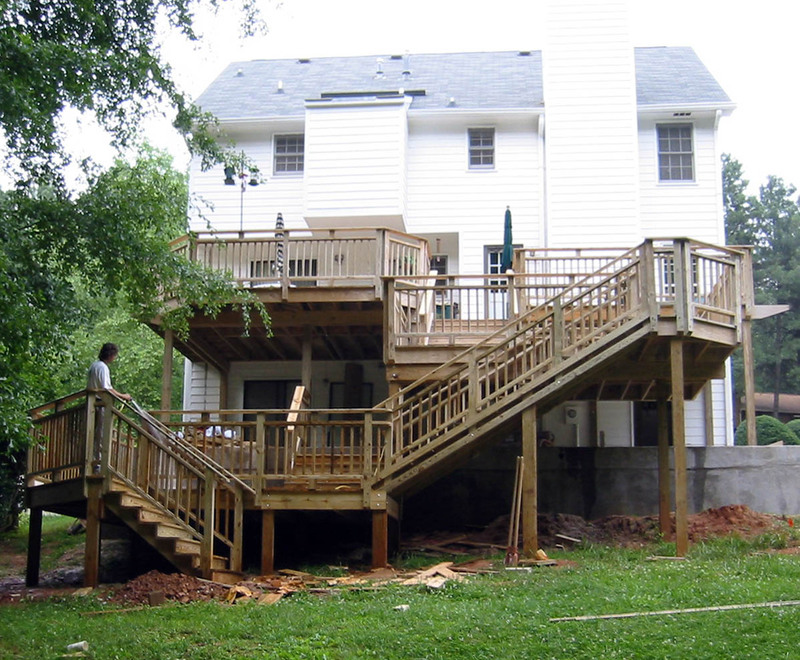 We are extremely familiar with the different deck materials available and our crews have used these materials to build single level and multi-level decks throughout Baltimore and Harford counties. If you have any questions about Custom Deck Construction in Baltimore and Harford Counties, please contact Freedom Fence and Home by calling 443-271-6841 or visit our website. You can also follow us on Facebook and Twitter! This entry was posted on Tuesday, March 24th, 2015	at 3:29 pm	. Both comments and pings are currently closed.